What is consistency? How does MGS produce greater consistency? What is consistency? How does the MGS gives you greater consistency? What is consistency? Surely it is the first thing most golfers should strive for, so that they can have better scores on a repeating basis? So, for the full-swing, consistency can mean total number of fairways hit, or number of greens made, on a regular basis. This in turn would mean a golfer should have greater consistency at the shot-level so that ball speed, ball launch angle, ball starting angle as well as starting spin should repeat to a greater extent. Incidentally, an article that will be in the June issue of my avid golfer magazine (check this link in June 2017: http://myavidgolfer.com/the-magazine/) is about what PGA Tour players think about consistency and what they do to try to achieve it. In recent years a lot of research has been focused on variability within movement and how that is supposed to have many benefits. However, not all variability is good. “Good” variability is that of the various body parts having differing amounts of movement in each swing made by a golfer, while still all being able to come together to produce the least possible variability in the “outcome”. Outcome variability, or changes in shot patterns (such as a mixed-bag of fat, thin, hooked and sliced shots) each time a golfer hits a shot is then, naturally, “bad” variability. And “bad” variability can therefore be considered inconsistency. One recent study on movement variability (“Motor Abundance and Control Structure in the Golf Swing” by Morrison, McGrath and Wallace, 2016) in the golf swing found that higher skilled golfers (handicaps below 4) are better able to synchronize the many joint movement capabilities of their bodies to produce better results than intermediate golfers (handicaps 10-18). Stated in simple terms, while the body (head, trunk and legs) and arms might bend and rotate in a slightly different way in each swing, the more skilled golfers are still able to produce greater consistency of ball striking at impact. Also, all body movements during the golf swing can be divided into those which actively affect the resulting ball flight (outcome) and those which do not. With increasing expertise, more and more body parts are free to move in different ways without affecting the result of the swing. From other research in golf we know that there are 4 important movements which produce greater club speed –weight shift, torso rotation, lead shoulder/hand vertical lift and lower-body-before-upper-body sequencing – during the downswing. Here too, skilled golfers are able to produce greater amounts of desirable movements than less skilled golfers do. We also know that even highly skilled golfers can revert to the movement styles (in terms of variability of movement) of more novice golfers under conditions of anxiety or fatigue or when they have made changes to their swing movements which have not yet become “grooved in”. In other words, all golfers are capable of the movements seen in less skilled golfers under the right circumstances! Every golfer, then, can be considered to occasionally regress to a less-efficient movement, and thus it might be beneficial for all golfers – skilled and less skilled alike – to use a swing which intentionally “locks up” some joints so their movements cannot vary too much, while releasing others to be “as free as they like”. Enter the Minimalist Golf Swing (MGS) which does just that. It positions the golfer’s head, torso and legs (ie. “body”) to need very little of both downswing weight shift and vertical lead-shoulder lift, to quickly (the downswing lasts only 0.27 to 0.34 seconds!) get into the impact positions typically seen in the more skilled golfers. It also forces more body rotation than a “typical” swing, by positioning the body in a rotated-away-from-target position before the backswing even begins. The MGS therefore prevents the body from having too much movement, in too many directions, during the downswing – it reduces side-to-side and up-and-down movement, and mainly involves only rotation. While body movement is thus being reduced to essentially one dimension only, what about the arms? The MGS requires only one area of conscious focus during the backswing – on the lead upper-arm (left, of a right-handed golfer). The trail arm is free to do what it likes, at this time. [A side-note for technical clarification: the trail arm only appears to be “given complete freedom”. In reality, the stay-in-trail-side-lower, side-bend torso position of the MGS backswing forces the trail shoulder into better “external rotation” which in turn allows this arm to help deliver the club to the ball “from the inside”. The experts who study the brain’s ability to “self-organize” movement in different “situations” (more correctly termed “constraints”) may not remember that certain joints cannot function well from some positions, especially in a double-handed movement like the golf swing, so the brain cannot always self-organize for optimal results. 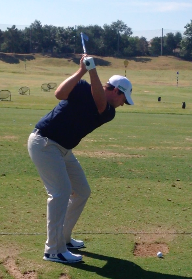 The MGS’ unique ability to maximize trail arm external rotation is perhaps the one of the biggest keys to its ability to produce greater ball-striking consistency. 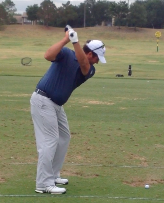 See pictures of TOUR Pros top-of-backswing internally rotated shoulders below (one even in putting!). The importance of top-of-backswing trail-shoulder external rotation is, however, a topic for another day.] As a result of all this intentional positioning of body parts during the set-up and backswing of the MGS, the downswing is often termed the “do-nothing-intentional” or “let-it-happen” part of the movement. Because of the inherent inability of some body parts to move any-which-way, the downswing is able to deliver the club to the ball on a more consistent basis, regardless of the brain’s ability or otherwise (as when a golfer is tired or anxious, for instance) to control movement.